Intertops Sportsbook favors the Aaron Rodgers and the Green Bay Packers (-145) to beat the Pittsburgh Steelers (+125) at Super Bowl XLV in Arlington, Texas on Sunday. The world’s first online sportsbook is offering dozens of betting propositions on the USA’s biggest game of the year, a special $100 deposit bonus and the chance to win $5000 in February. 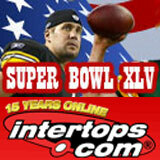 In addition to a comprehensive line-up of Super Bowl betting propositions, Intertops is giving away loads of free money. Between now and Sunday’s kick-off they’re adding 20% (up to $100) to all deposits. Also, every customer who wagers at least $10 in the Intertops Sportsbook every day during the month of February is automatically in the draw for a $5,000 prize with no rollover requirements! And if the game goes to overtime, Intertops will refund all Total Number of Touchdowns Scored bets. All odds are valid as of today but subject to change.